Roll together Dark Souls’ gruelling boss fights, the surging techno beats of Hotline Miami and Metal Gear Solid’s revenge-driven narrative and you’ll end up with Furi – a game that’s entirely made up of boss fights, controls like a twin-stick shooter and looks like a neon-drenched, drug-fuelled nightmare. If you can’t tell, I’m a fan. After unexpected classics? Check out the best indie games on PC. The mechanics are deceptively simple: you can dodge, shoot, slash and parry, and charge any one of those moves to produce exaggerated effect. Using a gamepad as the preferred means of control, Furi plays like a twin-stick shooter, where dodging, strafing and successfully reacting to telegraphed attacks is your only chance of surviving, let alone making it to the next challenger. Japanese design principles have guided the look and feel of Furi, from its responsive, kinetic combat to the rich aesthetics of each boss – a result of Afro Samurai’s Takashi Okazaki joining the project to create the game’s character designs. Much like in Dark Souls, failure comes down to simple mistakes and lapses in concentration, both of which are brutally punished by the game. Despite the game’s tutorial boss taking around half an hour to vanquish, the encounter felt charged and electric from start to finish thanks to a pulsing synthwave and techno soundtrack. Changes in perspective also keep gameplay from stagnating, with shifts between top-down and third person views signalling different threats for the player as well as a new rhythm to follow. The game’s narrative is still somewhat unknown. Players take control of a captive warrior who is unshackled by a mysterious figure and tasked with fighting his way to freedom. With each level taking the form of a sprawling boss encounter, the game’s narrative will likely be handled through cutscenes alone. 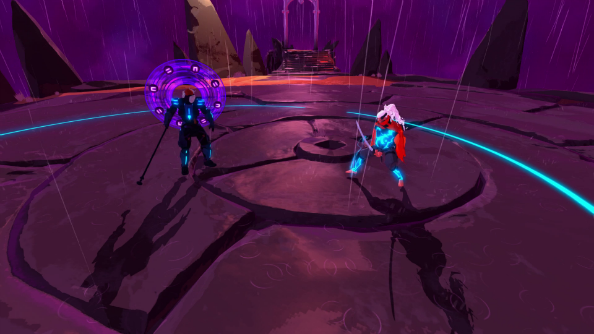 Making that quest for freedom and revenge enough of a drive for players to feel invested in Furi’s narrative won’t be easy. Having barely scraped through the game’s opening level and thoroughly enjoyed every second of it, it’ll be interesting to see what else The Game Bakers’ have devised for gamers in later levels, and whether they can sustain that exhausting pace for the full duration of Furi. The game is slated for a Summer 2016 release, though an exact date is yet to be confirmed. 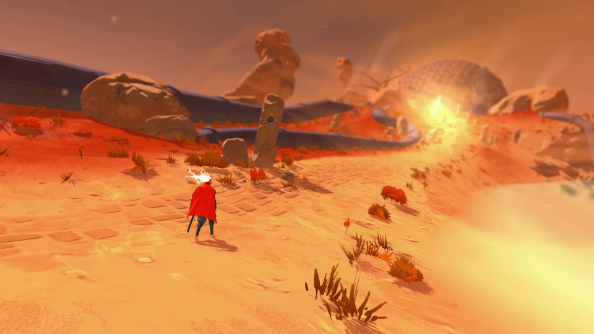 Can’t wait to get your hands on Furi? Shout your excitement at us in the comments below.